Virtually all of my ancestors who settled on the New World frontier in Western Pennsylvania did so on the fertile farmland north of Pittsburgh and the Allegheny River, Campbells, Grays, Pearces, and Nelsons, to name a few. But that land had not always belonged to the United States government or the Commonwealth of Pennsylvania. We often take for granted the sometimes violent process that took place before our kin could safely settle, farm, and raise families. This is a brief expose based primarily on the information found in the two books cited below, which I have found interesting and vital to the understanding of their struggles and hardships, often going unmentioned in public school history classes and genealogical reports. Yes, it took the White explorers, traders, and politicians to set the stage for what we today optimistically call development, but one Native American name stands out in making the process possible. We will call this great Indian leader Guyasuta, although historians may refer to him by many different pronunciations with various spellings: Kiahshuta, Kiosolos, Giosota, Gai-a Soot-her, and so on. This is his story with respect to our families and the properties, townships, boroughs, counties, and land in general between the Allegheny River and Lake Erie. 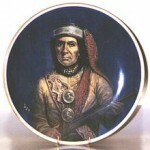 Guyasuta belonged to the Seneca tribe, one of the Six Nations of the Iroquois. Villages were comprised of long houses made of poles, sticks, branches, and animal hides. Staying in one place for as many as ten years, the subsistence living consisted of hunting, fishing, and planting. When the fish and game had been used up, these early people packed their few belongings and moved to a new location. According to Hardie, “The basic social unit of the Iroquios was the group of related women and their families.” The younger members obeyed the elders, who appointed men to serve on inter-tribal councils. Guyasuta had the reputation of being a convincing speaker. After the defeat of the French and their Indian allies at Fort Pitt in the autumn of 1758, the British and their caretaker Penn family in Philadelphia sought to keep the peace, forbidding White settlement north of Pittsburgh, across the Allegheny and Ohio Rivers. Three years later, the British commander, attempting to further discourage any segregation, forbade giving gifts to the natives. That only made them angry as they had grown accustomed to using the British bullets for hunting and they were running out of ammunition. Guyasuta traveled to the capital of the Midwestern tribes, Detroit, to expel the Whites. A company of at least 100 Delaware, Shawnee, Twightwee, and Cherokee made life very dangerous in what was known as “Northwest Indian Territory” for a few years. Sometime before 1768 Guyasuta had a change of heart. 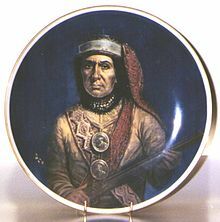 Together with 15 painted warriors and 1,100 other natives, he urged peace at a council at Fort Pitt. With the start of the Revolutionary War in 1776, the Senecas tried to maintain neutrality, but in the next few years squirmishes with White settlers near Kittaning and Hannastown left cabins burned and settlers and Indians dead. Guyasuta was caught in the middle. With the signing of the Fort Stanwix treaty, New York, in 1784, the former hunting grounds of the Senecas and the Six Nations west of the mountains and north of the Allegheny River was finally opened for White settlement. Although some rogue elements of the native peoples made immediate clearing, building, and farming unwise, eventually, with the financial encouragement of both the Federal and State governments through what was called the Depreciation Lands Act, the land was well-spoken for. The Grays sailed from Northern Ireland around 1790 to live in Northern Allegheny County. Our Henry Moon moved into what is now North Park by 1794. James Crawford established residence in O’Hara Township in 1808, followed by the Norrises in West Deer 1810, and our Campbells just two years later. By the time the Pearce and Austen brother-in-laws arrived at Pine Creek in 1820, their mill and farm site had already been developed. Ironically, with the establishment of North Park on their homestead a century later, the county actually imported real Indians and buffalo from the West as a promotional gimmick. But what ever happened to the “original settler,” Guyasuta? We know that Guyasuta accepted the gift of a log cabin from ally General James O’Hara in the township that is today named after the British officer. One story even says that O’Hara saved the life of Guyasuta, treating him after he had been bitten by a rattlesnake. One source says that he lived out his 74 years in that cabin with two wives. He waxed eloquent into his seventies, when he sent a flowery communiqué to the ruling Quakers in Philadelphia, asking for aid. The Commonwealth obligued. He died a legend in 1794, but where he’s buried is a mystery. Some say he lies in a burial mound near the north ramp of the Highland Park Bridge, while others believe his remains were interred in a burial ground near Lake Erie. Today, a statue in the Allegheny river town of Sharpsburg pays tribute to Guyasuta. Over the years various festivals have been held in O’Hara localities honoring his and the memory of all Native Americans who once thrived in these hills. Local legend has it that Guyasuta’s favorite daughter ran away with a man whom Guyasuta disliked, hiding in a cave undetected under a waterfall, only coming out when they had run out of food. Overcome with anger, the mighty chief supposedly could only be calmed with “medication,” fire water, dispensed by the medicine man, whereby Guyasuta agreed to officiate a ritual marriage and bestowed upon them a wedding feast and gifts fit for royalty. Today, Squaw Run Road and Park in Fox Chapel commemorate the events that took place there so long ago. Portrait of an American Community: O’Hara Township, PA. Chicora, PA: Mechling Bookbindery, 2008. Very good article. I have bookmarked your super page.